I went to an AA meeting yesterday. It was my first one in this area. “This” being my home for the next few months. It was a noon meeting. I really enjoyed it. I felt welcomed. I liked the people and the discussion. One of the women gave me a meeting list and collected phone numbers of several of the women for me. It felt like a scout meeting and I wish I had a sash. I would sew my sobriety chips on the sash as I earn them. I am not sure how often I can go to that particular meeting. I start working night shift tonight. Noon will be my midnight. But I did find a meeting near my job that starts an hour and half before my shift. So I plan to try to catch a meeting and then a quick bite before work. I just hope I wake up in time. I am not a “morning” person even if it is waking up in the evening. I love my bed more than I ever loved booze. I’m not sure I’m capable of leaving behind a personal message. But if I did, I hope it would be that it’s okay to be different from the crowd. In fact, it’s really good to be different from the crowd, and that we really should question ourselves before we pass judgement on someone who is different to us. I was using that quote to make myself feel better about being different from non-alcoholics. And here I was at a meeting that was about NOT being different from alcoholics. I remembered back to the first few times I went to AA meetings. I would listen to the stories about someone getting drunk at work, hiding bottles of liquor, or shooting up a drug and I thought “wow I am not that bad! I don’t do that. I just need to learn to control my drinking.” Years ago, I read Augusten Burroughs Dry and thought I would never be as bad as him. I read Brett Butler’s Knee Deep in Paradise and Jerry Stahl’s Permanent Midnight. I had a fascination with reading memoirs about addiction. I even told people I read them for comparasion and to feel better about my life. Now I read memoirs about addiction for support. So no, I am not different from the other alcoholics in there and even though I never did hard drugs, I can not say that I never would have done something that stupid while drunk. I am still trying to adjust to not being different from all those people and that I am different from the 90% of people that can moderate drinking. Another reason I was glad I went to this meeting was because of one woman. She shared a story because she was worried about some things she did. She is worried she might go to jail next week. I never met this woman before but I felt a heavy heart for her. I saw myself in her. I feel selfish now but I kept thinking “that could be me if I keep drinking”. I really wish her the best of luck and will pray for her. Prayer. Now that is something different. I will have to save that for another day’s entry. 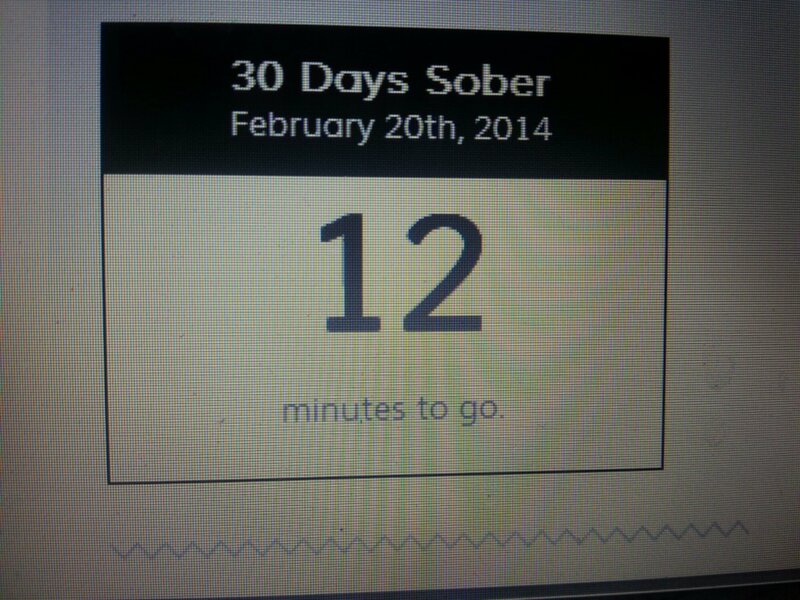 Today I am 30 days sober! 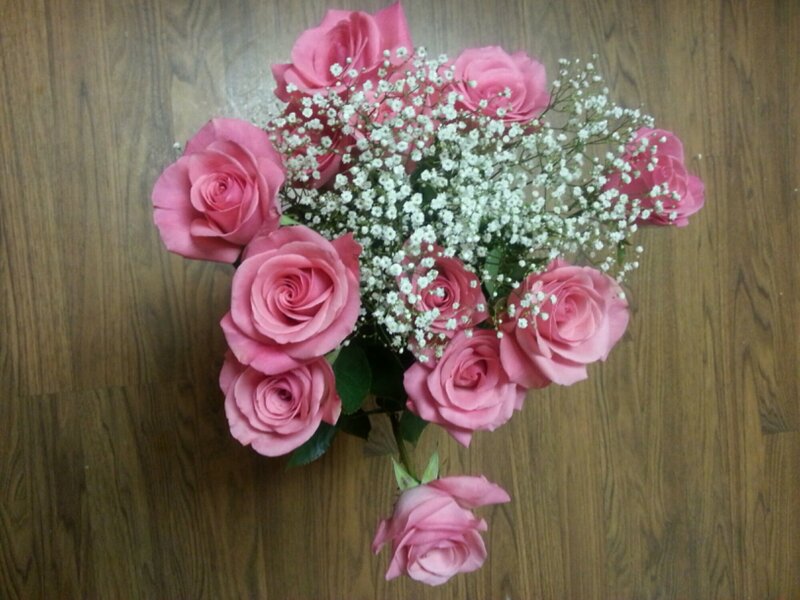 I bought myself some pink roses to celebrate. Mistake #23- I was dating a guy from a country that spoke a difficult language. Or at least it was difficult for me to learn. We were staying with his friends for one night while traveling in his country. We all went to a bar to meet up with more people. Everyone at the table started conversing in their native language. I felt left out and unwanted. I started to drink beer. I was ordering the largest size available. I played a game on my iPod. It was either Mahjong or a Tetris-like game. I was pretending to be completely engrossed in my game since I could not pay attention to the discussion. I was actually getting mad. How dare my boyfriend subject me to such a boring night? Why is he not explaining to me what is spoken or even the topic? Why is he not even chatting with me in English? The more I drank, the more angry I became. The more I drank, the more I started to blame him for the whole night being a failure. I drank and thought. Thought and drank. Negative rationales were brewing. My eyes started to water because I began to get depressed. When we left with his friends (since we were staying at their place), I continued to act super involved in my game. I walked a little bit behind the three of them. The girl in the couple stopped and walked along with me for a bit and asked about the game. I pretended the game was more interesting than chit chatting with her. I have no idea what the couple and my boyfriend talked about (in their language) but it was obvious I was upset. Back at the apartment, I went to our room right away. The couple offered us some beers but I refused. My boyfriend and I fought in the bedroom some. He did not understand why I wanted to stay in the bedroom. I was too embarassed at this point to want to have drinks with them. I cried myself to sleep alone. The same excuse as usual. Congratulations on day 30!!!! That is huge!! I’m so happy for you, and also that you gave yourself flowers!! You mentioned that we could share any advice…so here it is. Please be aware of PAWS (post acute withdrawal syndrome. I didn’t bother to really check it out..as in my alcoholic brain, I just decided that it didn’t pertain to me…which ultimately led to many day 1’s. As you move further into your sobriety, you may start to feel uneasy. Memory loss…crankiness, depression..and for no apparent reason. This is completely normal, and is actually your body healing. But it can be a tad confusing. So..take a peek, check it out, and be prepared, as being aware of it can make a big difference. And, it’s temporary. They say it hits around the same times as some milestones…30, 60, 90 days… When it does hit..if it does hit…just be very kind to yourself. Self care…pampering…treat yourself with kid gloves, and know that you are giving yourself probably the biggest gift you can! Best wishes!!!! Thanks for the advice. I have been very cranky the last few days and getting upset about little things. I thought it was PMS. I will keep this in mind. Congrats on your 30 days! And yes, we look for the similarities, not the differences. We spent our time trying to isolate and see ourselves as different (as per your story), but in the end we are all the same, in terms of our alcoholism. I do want to say that we are all unique as well – we all have skills and talents and abilities and looks, etc. that do keep us different. That shouldn’t be tamped down. We get sober to live life to the fullest – so I do take what Mr. Depp says as good. But in the rooms, we are all the same. no better, no worse. As for your story – hey, I think that was rude of your boyfriend, if I may be so blunt. I would have rathered stay at home if he were to do that. Nothing wrong with him conversing with others in native language, but it was his job to keep you involved some way. But i do like how you took responsibility for your feelings and actions…wonderful insight. Congrats on 30 days! Know that somewhere on earth I, and countless of our fellows, know exactly what it means to live the volatile shame that is the life of a drunk. In other words, I feel you sister. I have lived the humiliation right along with you. It’s good to think back to those awful moments, to remind ourselves what else is in that package we buy when we take that drink. I’m happy to hear you attended a meeting. You might have reservations about AA, or see it as not central to your recovery, or whatever. And however it fits into sobriety for you is great. Objectively, those meetings are fundamentally good things, whether you attend 5 a day or 1 a month. They offer a place where people help one another with a common problem. And they suggest a moral way of life, and promise that living upright will give you peace. It’s pretty hard to argue with any of that. Always a pleasure to read your prose. Please keep posting. I know I can’t do daily but I will go to gain real life support people and hear the stories. I really identify with your story about being left out of the conversation and handling it with more ETOH. I can not count the number of times I was emotionally hurt and drank. The only person I was hurting was myself…The more I drank the more the entire situation was blown out of proportion and actually became confusing for me to interpret/decipher and handle. There were times that I would cry so deep from my soul because some jerk was mean, rude, thoughtless, inconsiderate etc. My coping method was, gulp..gulp…gulp..They never knew how I hurt my body because of their remarks, actions or lack of actions. Congratulations on 30 days! I’ve hidden so many issues and problems in the bottom of a bottle. Stay tuned for more….